I called Tyler and he came out the next day to give me an estimate and explained the process of cleaning and sealing my driveway pavers. We scheduled a date and his crew showed up on time and did an excellent job. The pavers look better than new. I give Red Hot a 5 star rating and have no hesitation in recommending them. Excellent service, very professional. Tyler and his employees went above and beyond to make sure all went well. 5 STARS! Highly recommend! Our driveway was a disaster with weed growing through the pavers seams and mold growing everywhere.. Tyler came out and explained what it entailed to get our driveway back to the original state. He and his crew were punctual and got the job done as promised. They were very clean and carted away all of the waste material. We are so happy with the end results. Our house looks great with the driveway as the first impression you get when you come to our home. Thanks again. Excellent work. Very conscientious and leaves the property in the same condition as before their visit. 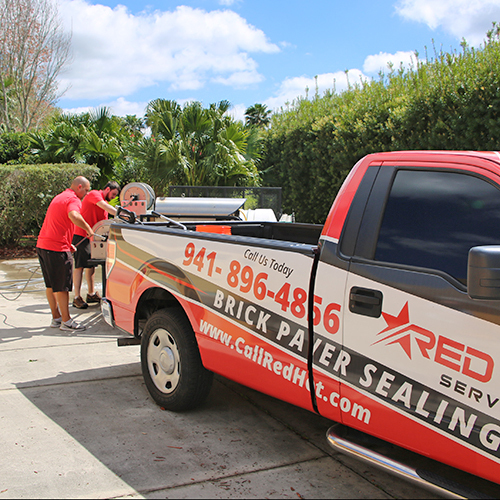 When I contacted Red Hot Services, I was surprised how quickly Tyler stopped by to provide an accurate estimate. I found him to be professional and easy to work with. I appreciated Tyler being honest about the condition of the roof. He also explained the cleaning process in detail which helped me become more educated about different techniques companies use. I have an older roof and it was very important the roof not be damaged. Tyler did everything he said he was going to do. He communicated well, was timely, did an excellent job on everything he cleaned, and his price was competitive and fair. My roof looks new and Tyler was able to remove some stains from the sidewalk and driveway another contractor had left behind. I would highly recommend this business and plan to use them again.